The Loft defies its one bedroom status with ample seating and dining options perfect for entertaining. I love how it feels like an apartment and a luxury villa all at once. Plus, it’s in the center of Gustavia and everything is just a walk away! The Loft Villa is stylish, cosmopolitan, and convenient, with all the amenities a guest could want on a private holiday. 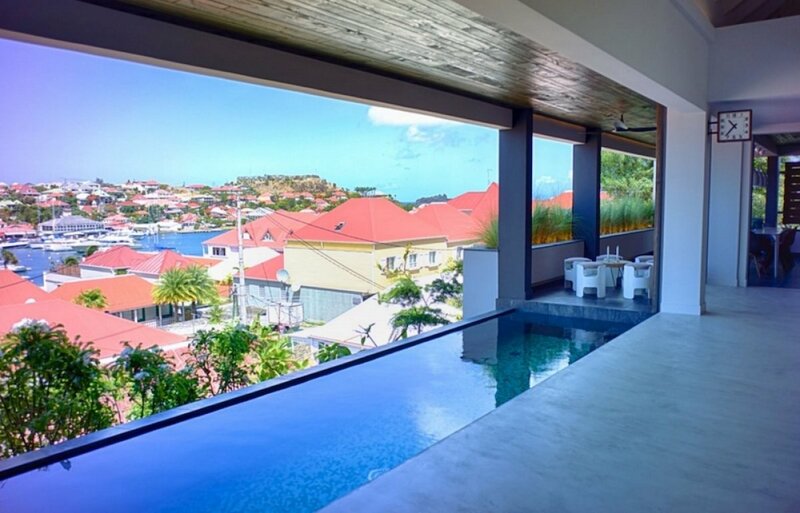 The Loft is close to Gustavia’s boutiques, restaurants, and nightclubs but is also in a secluded enclave. The Loft’s infinity pool looks out over town and the marina, and sits adjacent to a sitting nook. The pool opens to the living and cooking area for convenience. The large living room opens onto the pool and terrace, while doubling as a game room. A hanging chair, leather couch, and armchairs provide several seating options for two guests. The expansive, well-appointed kitchen has a large island that doubles as a bar, and blends with the living area seamlessly. The dining area is adjacent to the kitchen, and seats 10. The master bedroom lies opposite of the kitchen. The room has a European king bed, an ensuite bath, and a private terrace with sea views. An optional second bedroom downstairs is versatile enough to accommodate young families or romance-seeking couples.